Department Zero's resident fashion guru, Carman, has lately been filling you all in on the wonderful ways that high fashion designers are incorporating high tech materials and features into their designs. While the likes of Diesel and Rebecca Minkoff are elevating wearable tech from functional to fabulous, there are some pretty rad things happening in the functional tech space. These wearable tech pieces that are much more about delivering function for your sport of choice- and plenty of them are not designed for your wrist. The industry is exploding with new options available everyday. Nixie – Wearable drone technology for the GoPro set. 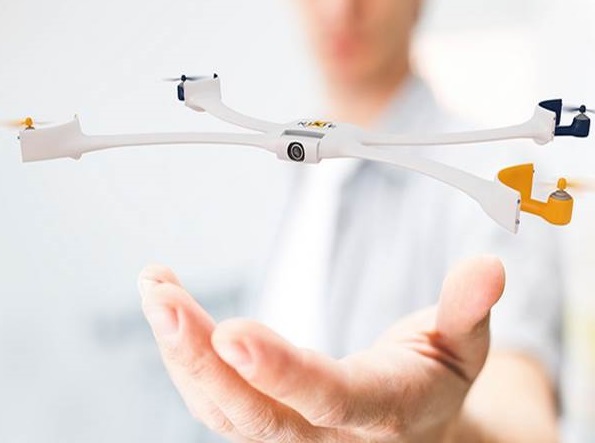 When you are about to do something amazing (or mundane- you do you) pop this camera drone that you wear on your freaking wrist off and let it fly to grab the ultimate shot before it returns to you. SMS Audio Bio Sport buds – Dual purpose ear buds that deliver your playlist as well as tracking heartrate are high up on the list of must haves. Skully – This company is taking brain buckets to the next next next level, with an augmented reality heads up display and 180 degree rear camera. If motorsports are your game, your head needs this. Zepp – For any sport where you are focused on your swing, like Baseball, Golf, Tennis, or Softball, etc., pop a Zepp pod to your glove to see in 360 degrees what you are really doing. MOOV – This one is designed to wear wherever, BUT with the ability to actually let you know when your form is off, or if you’re not working optimally during your sport of choice, there is big potential for this little disk.